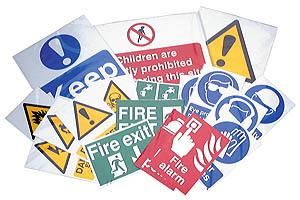 We offer a comprehensive range of safety, warning, information and metallic signs, featuring self adhesive backing and compliance to EU and BS standards. 200 x 300 'Standard' for industrial, office, and shops. Manufactured from high quality PVC for extended durability, making them ideal for outdoor use in any weather conditions. Rigid backing board (Class 1 fire rating to BS476 Part 11 (1987)) available for 'Jumbo' size, allowing mounting to fences, uneven surfaces, etc. Convenience - peel off backing reveals a powerful adhesive for a fast, strong bond to most flat surfaces. Rigid backing board available for 'Jumbo' size allowing mounting to fences, uneven surfaces, etc. For use with 200 x 300mm (standard) self-adhesive semi-rigid plastic signs. Sign not included. Covers most requirements for general purpose survey, construction and building sites. Comprises of an all weather, all steel, go anywhere collapsible road sign tripod in a fully galvanised heavy gauge tubular steel construction. Portable roll-up road signs designed to meet the requirements of BS 873 Part 6 and the New Roads & Streetworks Act.